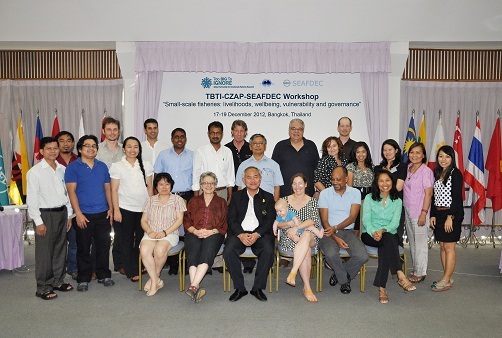 The TBTI-CZAP-SEAFDEC Workshop on “Small-scale fisheries: livelihoods, wellbeing, vulnerability and governance” and the Asia & Oceania regional meeting took place between December 17-20, 2012, in Bangkok, Thailand. The workshop was jointly organized by the SSHRC-funded global research partnership on small-scale fisheries, Too Big to Ignore, the Coastal Zone Asia-Pacific (CZAP) Secretariat and the Southeast Asian Fisheries Development Center (SEAFDEC). The purpose of the workshop was to bring together researchers, government officials and other fisheries stakeholders to discuss issues concerning small-scale fisheries in Asia and Oceania region, and to exchange ideas about approaches and tools necessary to address these concerns. The workshop was focused specifically on the importance of small-scale fisheries to coastal livelihoods and wellbeing, on how vulnerable coastal people are to natural phenomena and anthropogenic changes, and on how governance systems, such as co-management, can be used to enhance opportunities of fishing people, especially women, in engaging in livelihood opportunities. In addition, the TBTI Asia & Oceania regional meeting was an opportunity to discuss research priorities and plan activities in the region.